North Dakota DeLorme Atlas: Road Maps, Topography and More! Find trailheads on Petrified Forest Trail! 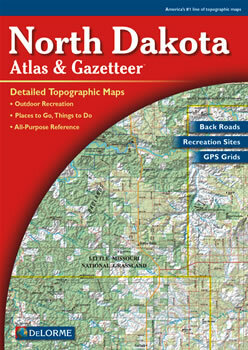 Discover North Dakota with the DeLorme Atlas and Gazetteer! This up-to-date atlas has 56 large pages of shaded relief maps accompanied by an index of the place names and map features. The back cover of this atlas has a large map of North Dakota with an overlying grid. Each cell of the grid contains the page number for a detailed map of that area. Many physical and man-made features are shown on these detailed maps. The features include: rivers, lakes, grasslands, buttes, mountains, forests, railroads, roads, highways, airports, place names, Indian Reservations, wilderness areas and parks. There are 8 pages of reference information for the state's wildlife viewing, fishing, hunting, camping, hiking, attractions, unique natural features, historic sites and Tribal lands. The atlas has state-wide topographic information shown by contour lines with intervals of 120 feet. You will be impressed with the details and extras that the DeLorme Atlas and Gazetteer has to offer!